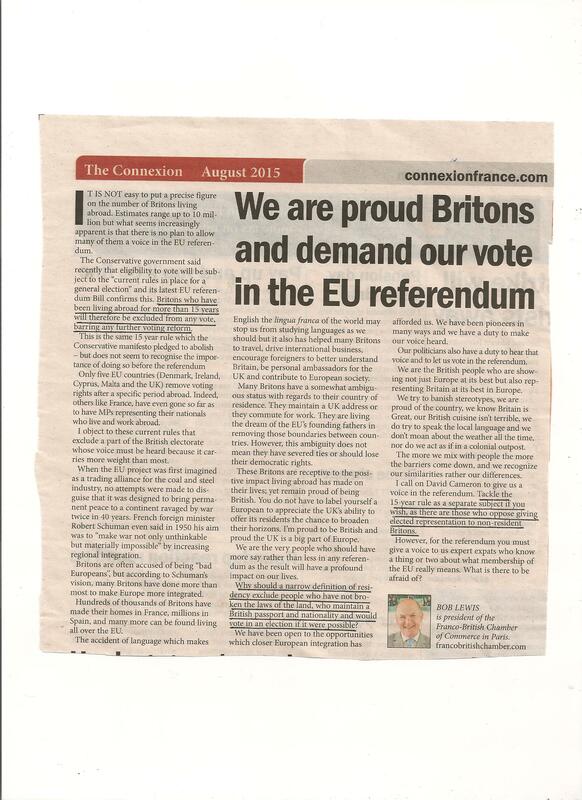 Here’s an interesting article in The Connexion of August 2015 by Bob Lewis who is currently President of the Franco-British Chamber of Commerce in Paris. He argues that all British expatriates within the EU should have a vote in the upcoming Referendum on Britain’s continuing membership, even if the 15-year-rule is treated as a separate subject. However, suggesting to the Prime Minister to “tackle the 15-year rule as a separate subject if you wish, as there are those who oppose giving elected representation to non-resident Britons”, can only apply to those expatriate British citizens living outside the EU. Those expatriate Britons resident within the EU and, therefore, directly impacted by the outcome of the Referendum on Britain’s continuing membership, can already present this as a valid counter argument for their right to vote. This entry was posted in All EU Brits Need Voice, All EU.Res. Expat Brits in EU.Ref., Brexit Impacts 2 Million Expat Brits!, EU Ref Question - Lord Lexden 6 July 2015, EU Ref Votes for Life Response, EU Ref. & Votes for Life Bills, EU Ref. excluded British Expats React, EU Ref: Overseas Electors - Counter Arguments, Euro Weekly: Expat EU Referendum Concerns, Expat Eggs in EU Ref Omelette, Expats: what happens if Brexit?, Harry Shindler Presses PM., Harry Shindler: Why Stiil 15 yr limit for EU Referendum?, Queens Speech: Expat Votes for Life, Voting Rights and tagged 15-year-rule, British expatriates, EU Referendum, national voting rights. Bookmark the permalink. And why should it be limited only to EU-resident British expats? I can see why some people would have this view, but I see no difference. For expats living elsewhere in the world, who will hopefully be able to vote in general elections following the lifting of the ridiculous 15-year rule, those most likely to vote are those who care about the politics of their native country. Just because we might not be directly affected by EU laws at the present time does not mean we are not interested in the future of our nation. As they say ‘It’s a no-brainer’ – To anyone who has a brain it is plain stark simply obvious. Those who are most affected by the decision of the Referendum must have a voice. Why are the brains of those with the power not active? They are, are they? deliberately stifling the voice of the people?